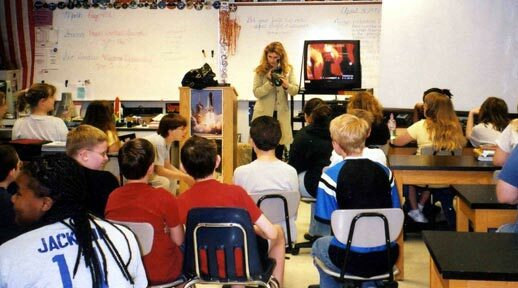 Dr. Michelle Thaller visits a class in Labette County, Kansas, April 2002. Dr. Michelle was one of four Visiting Researchers and one Visiting Educator that conducted 95 presentations for 3,700 grade K-12 students in 17 schools—all the students in four school districts. 1,800 parents, students, and teachers showed up for the family and public program, and 175 grade K-12 teachers were trained at the educator workshops. Dr. Thaller, then from the University of California at Berkeley, is an ‘infrared astronomer’, and studies the colder regions of the Universe. She’s discussing with the class that very hot objects like the Sun give off plenty of light that you can see, plenty of ‘visible’ light. Cold objects, like planets and people, and clouds of gas and dust from which stars are born, also give off light but it’s invisible to the human eye. It is called ‘infrared’ light. On a dark night you might not be able to see anything, but if you wore night vision goggles you could see, e.g., people, clearly. The goggles are infrared cameras that can see the infrared light pouring out of the people, and then convert the infrared light to a visible light that your eyes can see. As an infrared astronomer, Dr. Michelle uses infrared cameras on telescopes to study the cold objects in the Universe, objects which make themselves known by the infrared light they give off. She wanted to really let the kids understand all this, so she brought an infrared camera to class. She is pointing it at the class, and the infrared light pouring out of the kids shows up as a visible light image on the television behind her. Today she works with the Spitzer Space Telescope, a powerful infrared telescope in orbit around the Earth.